This is an interesting and characterful branch line, with a varied history. The story begins in 1807, when Royal Assent was received for the incorporation of the ‘’Harbour Company’’ to construct an extensive harbour at Folkestone, using finance provided by the Government’s Loans Commission. Construction began in the following year, and Scottish-born Thomas Telford acted as consulting engineer. Telford had previously been involved in the enlargement of Somerset House (The Strand, London), and had also engineered canals and roads in Shropshire. 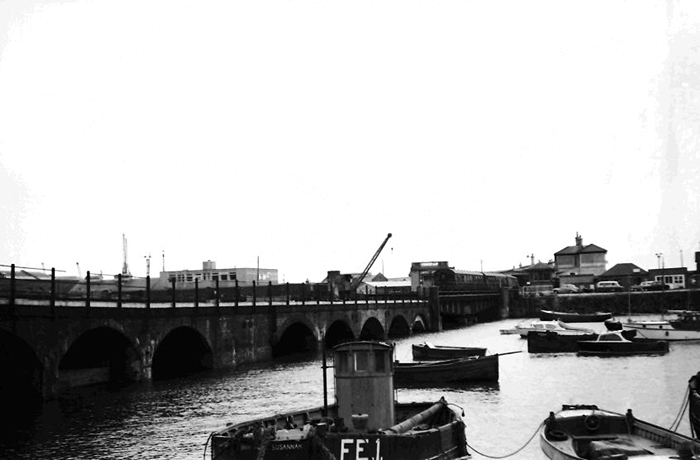 However, Parliamentary approval of the Folkestone Harbour project had originally been passed on the basis of a design developed by West County-born engineer William Jessop. Amended plans outlined a harbour of 14 acres in extent, a scaled-down figure from the original proposals. The formation of a harbour at this location had been helped by the presence of an existing spit head of shingle which partly formed the desired shape. Twelve years were to pass before the project was deemed complete. The harbour walls were formed by laying two parallel rows of stone slabs, angled inwards at 45 degrees. The gap in-between the rows of slabs was subsequently in-filled with crushed stone. Three walls – or, rather, piers – were formed during the construction: West, South, and East. The former two were, essentially, two of the same thing, for the pair were joined together at right angles to form an L-shape harbour wall to the south. The East Pier was constructed for the purpose of protecting the harbour from incoming winds from this direction, and its presence created an enclosed body of water, accessed by means of 120-foot gap between it and the South Pier. The disadvantage of having a trapped body of water soon became apparent, as the current of the English Channel carried silt into the harbour, where the deposits settled. The Harbour Company deemed the silt removal process as too expensive, but this decision soon put paid to the profitability of the operation, and in 1842, the company went bankrupt. In the meantime, railway expansion from London had been in full swing. The London & Greenwich Railway had commenced operation between Spa Road and Deptford on 8th February 1836, and in the same year, the South Eastern Railway (SER) was formed. The latter had received Royal Assent for the construction of a Weald of Kent line to Dover, branching off the existing London & Croydon and London & Brighton Railways’ metals at Redhill. The company commenced operation between London Bridge and Tonbridge on 26th May 1842, and this was followed by the opening of an eastward extension to Folkestone on 28th June 1843, the line initially terminating at temporary accommodation. A permanent station, named ‘’Folkstone’’ (note the missing ‘’e’’) was opened to traffic on 18th December 1843, after the completion of the impressive Foord Viaduct. The latter comprised nineteen arches, the tallest reaching 100-foot high, and took half a year to complete. 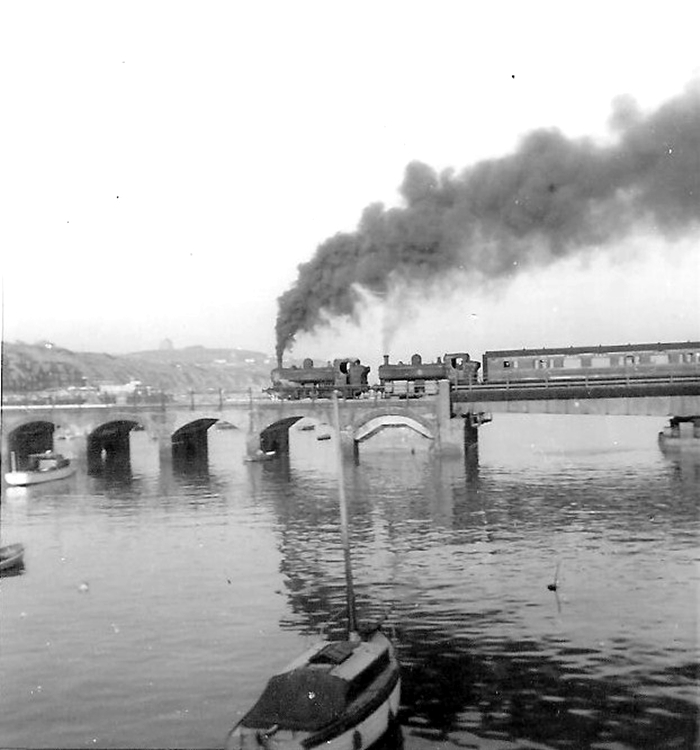 In conjunction with the viaduct works and the opening of a new station site, the SER bought out the bankrupt Folkestone Harbour operation, and was eager to commence steamer services across the English Channel. Unfortunately, as a condition of the original 1836 Act of Incorporation, the company was forbidden to run a passenger boat operation to the Continent. To bypass this obstacle, the SER, and, indeed, other railway companies, established nominally independent concerns to run the steamers. On acquisition of the harbour in 1843, the railway company began constructing a 1325-yard-long double-track branch line, descending at a gradient of 1 in 30, towards the water. 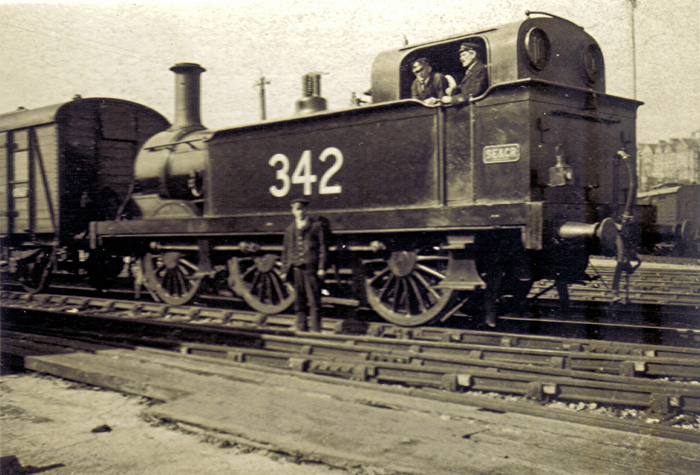 This terminated at a coal jetty, and had a trailing connection with the incoming line from London. A peculiar characteristic of this branch from the outset was that it could only be accessed from the main line by means of a head-shunt manoeuvre into sidings. The SER’s jetty was originally constituted of a brick viaduct, of which twelve arches spanned the water for the majority of the harbour’s north to south width, and ran parallel with the west pier. The viaduct accommodated a double-track, and flanking the structure on either side were wooden additions which were each host to a single line – thus, in total, four tracks ran parallel with each other across the water here. The viaduct seemingly terminated in limbo, for there was a 150-foot gap between it and the southern pier. Behind the southern pier existed the aforementioned shingle spit; ultimately, the SER was to fill the breach and take the line over the remaining stretch of water, and establish extensive goods and passenger facilities upon the site. This the company did in 1847, and to permit continued access by boats to what had become the ‘’Inner Harbour’’, a swing bridge was built within the 150-foot gap. This rested upon a centrally-located brick support, and rotated upon an axis much in the same fashion as an aircraft propeller. From 1843 onwards, when railway operation down the branch first commenced, through to 1847, when the line was fully extended over the whole width of the harbour by means of the earlier-mentioned swing bridge, the SER undertook a land reclamation task, which sought to extend the width of the shingle spit head southwards. 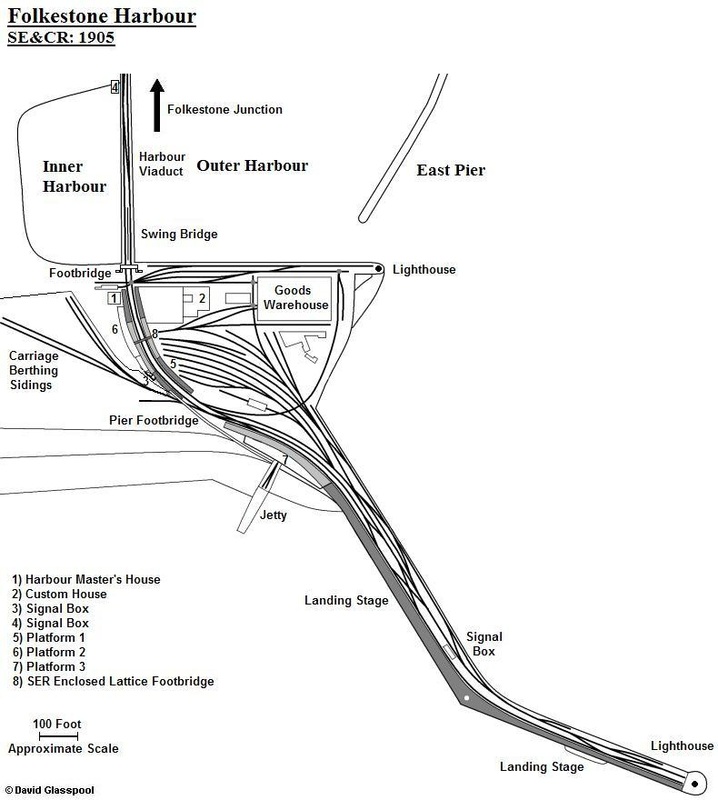 Not only would this allow the construction of a terminus station and a large warehouse within a maze of lines, but it also laid the foundations for the construction of yet another pier. Passenger services to Folkestone Harbour commenced on New Years Day 1849, but only temporary arrangements were in place on the southern side of the water, as construction of the terminus was still ensuing. Completion of the station came in the following year: this became a two-platform northward-facing affair, serving a double-track and demonstrating an overall roof. 70 yards to the east of the station existed a rail-served goods warehouse, measuring 180-feet in length by 90-feet in width. A pair of spaced out tracks entered the building, the two being fed directly by small wagon turntables.